Ysabel Regina is a blend of the finest Spanish brandies and cognacs aged in moist Pedro Ximenez casks; the perfect start for a noble spirit. 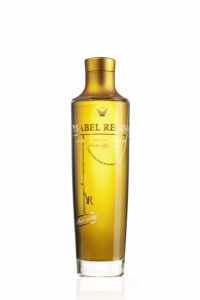 Blending the most noble of elements guarantees that no-one who drinks Ysabel Regina remains indifferent. This regal cross-breeding is part of the very essence of Ysabel Regina. Ysabel Regina is an “assemblage” (or blend) of French and Spanish brandies, respectively Petit and Grande Champagne VSOP Cognac (aged 4 yrs) with Brandy Solera Gran Reserve (aged 10 yrs ). The final blend is then aged approximately 12 months in Pedro Ximenez casks from the Ximenez Spinola family who have been making brandy and sherry in Jerez, Spain for nearly nine generations. YR unites centuries of tradition with modern innovation; some say it is virtually a cocktail in itself. Enjoy neat, over ice, or in traditional brandy and even whiskey based cocktails. Please use the Product Finder to locate Ysabel Regina in your area.